I have written many blogs on the subject of evolution. You might wonder why that is such an important subject. In order to gain prominence in society, evolution has been promoted as science. 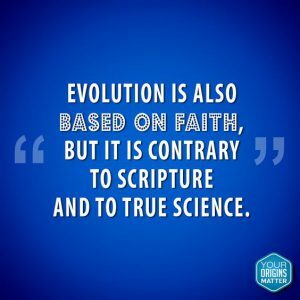 But the question that needs to be asked is, “Is evolution a science?” Let us address a few aspects of this subject and see if we can find an answer to that question. Science in its’ purest sense means knowledge. When we say, “Knowledge,” we mean facts based on truth which can be repeated experimentally and will yield the same outcome each time the experiment is performed. From these experiments a hypothesis can be confirmed or falsified. If it is falsified, it is cast aside. If it is confirmed time and time again it becomes a “law”. There are many laws of science which have been confirmed. If a theory is continually falsified by these laws it is no longer considered a scientific principle. It then becomes a myth or a religious belief. Before we get too far along, let us define what is meant by evolution. Most evolutionist will try to convince you that evolution is true by using a very generic definition. It goes something like this: Evolution is change in a living organism. To be quite clear, that is a non definition and can cover any situation you might name. For instance. If I change the clothes that I am wearing, have I evolved? No. I have not. But according to the evolutionist’s definition of evolution, I have evolved. Do you see my point. If you are to use this definition, you must then define what kind of change you are talking about. Since the discovery of DNA, science has been able to come to a clearer definition of the “change” that is necessary to bring about “Darwinian” evolution. In “Darwinian” evolution there must be an increase in complexity of the species from one generation to the next. Evolutionists realized that this would take eons to bring about the complexity which we observe in living things. Hence, they infer billions of years. The means by which this complexity is added, according to the evolutionist, is through mutations in the DNA. They conjure that over millions of years these mutations bring about changes until we see bacteria transformed into human beings. 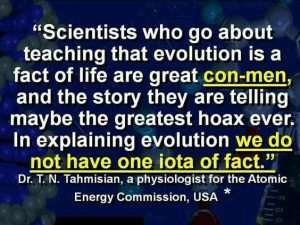 If everything works the way the evolutionists say, then they will have scientific grounds on which to make their claim of evolution bringing about ever-increasing complexity. What do the scientific laws say? First law of thermodynamics. This law says that matter/energy can neither be created nor destroyed. Either can change from one to the other, but the amount of matter/energy remains the same. Matter and energy are different manifestations of the same entity. They may change forms, but the amount of entity remains constant. I mention this because evolution, denying the existence of a Creator, has its basis in such beliefs as “The Big Bang” theory of the beginning of the universe. This scenario contradicts the first law of thermodynamics. (Believers in this theory come up with all kinds of other myths to establish it. But they, too, are based on myth). Second law of thermodynamics. The second law of thermodynamics says that in a system entropy will always increase. Entropy is disorder. So, if order is always increasing in a system, how did this universe attain such order? If entropy always increases, how did the simplest living cell attain and maintain such exquisite balance and order from chaos? If the second law is true, and it is, it also applies to the information contained in DNA. To overcome the second law of thermodynamics mutations in the DNA would need to increase information in the DNA. 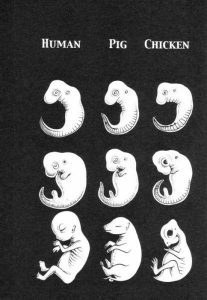 Unfortunately for the evolutionist, mutations follow the second law. They never increase information. At best, they do not delete information. Over 99% of mutations subtract information. The law of biogenesis. This law just plainly states that “life comes only from life”. In 1862 Louis Pasteur proved this fact. It still a fact and is a scientific law. Evolutionists have never been able to produce an experiment which will turn inorganic material into living organisms. Though there are many laws which stand against evolution we shall mention only one more. That is the law of probability. The law of probability says that the odds of the simplest protein found in a living thing being formed by chance is 1 in 10>104(that is one chance in ten followed by 104 zeros). The law of probability says that anything with a probability of greater than 1 in 10>40 will never happen. To give a little perspective, there are only 10>80 atoms in the whole universe. Knowing the probability of forming one protein makes the forming of the 356 proteins necessary for the simplest living thing seem astronomical, and it is. The probability of that is 1 in 10>4004. 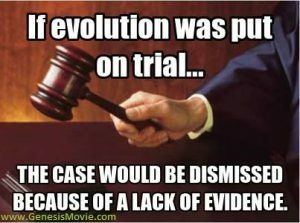 Evolution is a scam that has been forced upon western civilization in an effort to do away with its’ very foundations. Those foundations are those of the Judeo-Christian beliefs of the Bible. Let’s look at three movements which were founded on the beliefs of evolution. See what the results of these movements brought about. First is the Communist revolution brought about in Russia. It was founded on the teachings of Karl Marx who was a great admirer of Charles Darwin and his teachings of evolution. Because he believed that some races or civilizations were more evolved than others, it was OK to kill off entire populations. He grounded this all in the teachings of “survival of the fittest” espoused by Charles Darwin. Stalin annihilated over 30 million people because he decided he did not need them. Stalin was an ardent student of Darwin. Adolf Hitler and the Third Reicht were well grounded in Darwinian evolution. Because Hitler decided that Jews and Gypsies were lesser evolved than the Aryan race it was alright to slaughter them and take their possessions. Mao Zedong and the Communist revolution in China killed over 50 million people. Take a guess as to who one of his most admired persons was. You guessed it, Charles Darwin. Over 50 million people were murdered for the sake of the survival of the fittest. What are we to conclude from the evidence? Let’s address the questions. Is evolution a science? A resounding, “NO!”. There is not one scientific law that will uphold it. Every scientific law that can address it declares it not to be scientific. Is evolution a religion? “YES”! When every scientific law and experiment falsifies a given premise, then to still hold to it makes it a religion, not a science. Is evolution a scam? Without a doubt! For almost a hundred years our educational systems have taught us that evolution is a fact. In spite of scientific evidence to the contrary, it is still taught as fact. Because of this “lie” that has been taught, and is still being taught to those in the public education system, we see the fruit of it being manifested in the tumult of our society. If the root of the tree is poison, can the fruit produce good? I would love to hear what you think about this subject. Please leave a comment below. I shall do my best to respond promptly. Find interesting reading by clicking the banner below.